Steam billowing up from under snow bridges, sideways jaw-freezing hail turning your woolly hat white, sunburned noses, soggy tents and dust storms. Lush mossy landscapes set against black volcanic ash tinged by red and green, and dark verdant canyons filled with thundering waterfalls. 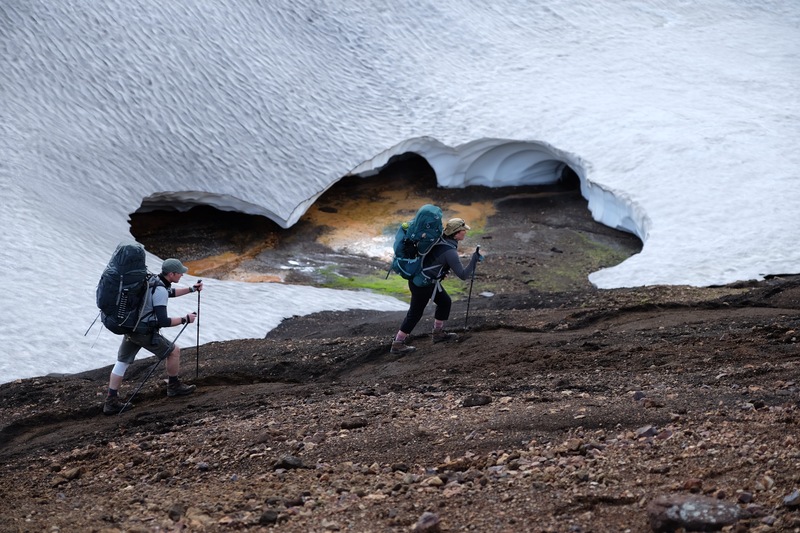 The Laugavegur trail is considered to be one of the most beautiful trails in the world, a fact I will admit I wasn’t wholly aware of when I was deciding where I would plan the trekking expedition for my unit. 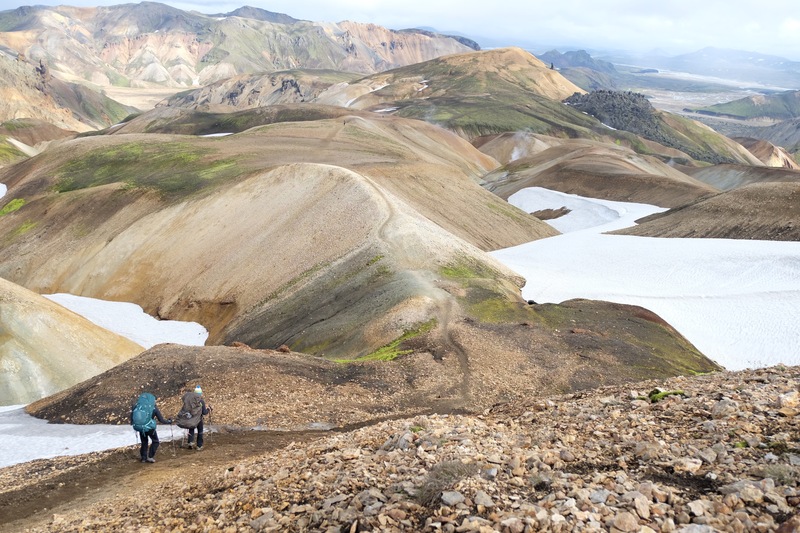 It is the longest trail in Iceland – just over 80km in length if you go the full distance from the hot springs of Landmannalaugar to the glittering waterfalls of Skogar. But all this beauty is not that easy to access; the trail is only open to the majority of mortals over the months of mid July to late August. The rest of the year it is rendered inaccessible by snow. My first sight of the volcanic mountainous area was as the full size Reykjavik Excursions coach suddenly trundled off the road onto dirt tracks – tracks which have never seen a whisper of tarmac or a digger. According to the audio guide on the bus, this road was ‘organic’, it just formed from cars driving on it over the years. The rain was driving hard into the windscreen and we peered through the glass to see a forbidding, stark and alien beauty unlike anything any of us had seen before. The team of 8 hardy souls on the trekking expedition were all from 77th Brigade and 170 Royal Engineer Works Group. A group representing a huge breadth of Army backgrounds, from the Royal Artillery, Adjutant General’s Corps, Royal Army Medical Corps, Royal Engineers and Royal Anglians (Infantry). The chat never lagged and the conversational topics ranged far and wide. Cryptic crossword clues kept spirits up and minds focussed on other matters as we tramped up and down and over the trail hunched under the weight of seven days of food, fuel and camping gear. There is a popular Icelandic saying: ‘If you don’t like the weather, just wait 5 minutes’. One moment hail, another sunshine. 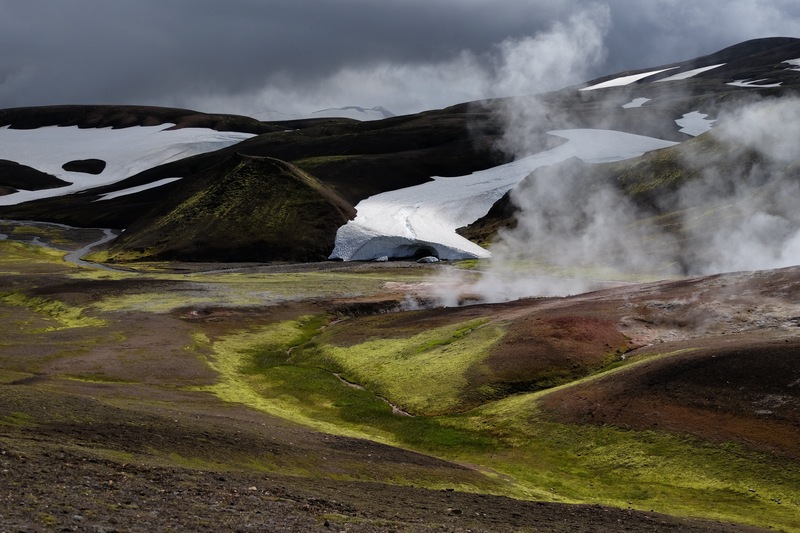 The photographers on our trip were in paroxysms of delight as they were able to capture the raw glory of the Laugavegur trail in all her guises in a relatively short space of space. The expedition team was beautifully in sync with the visceral appreciation of the scenery and the enjoyment of the physical challenge. Although the trek is popular, there is space for everyone and there is rarely the feeling of overcrowding on the hike. However you may need to time it so that you aren’t hiking with a crowd, unless that it your personal preference. After each day’s hike we would get in to the camping area, pop the tent up and settle in. Smiling inside at the quiet satisfaction you get from actually using the items you have lugged from A to B. The day’s fun would not stop there; at every major stop there are sights and short treks to do if that is your pleasure and there is a weather window that makes it appealing. The deep and steep sided Markarflijotsglifur canyon and Sodull mountain top with 360 degree views are two notable ones along the way. I was surprised at the keenness of my party to put their feet back into cold sweaty boots and leave the sanctuary of their tent. The views were certainly reward enough and doing it without your home on your back definitely puts a spring in your step. 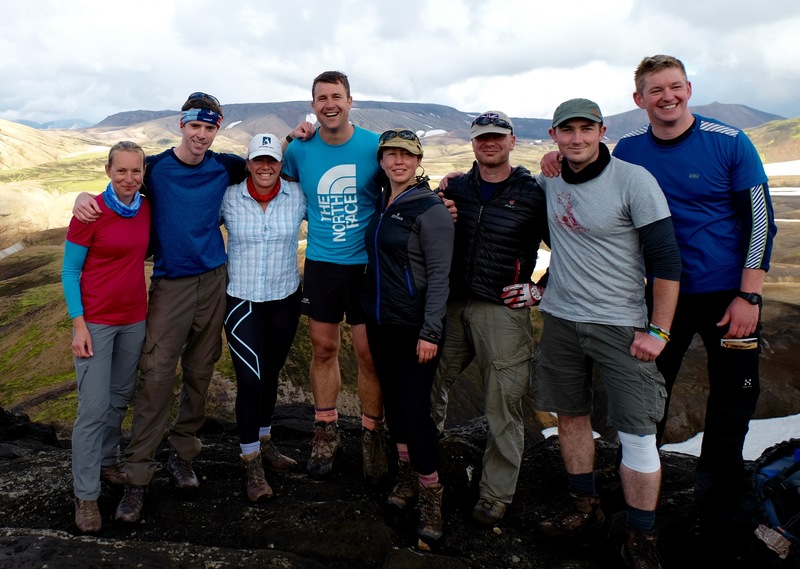 Many thanks go to the Ulysses Trust for supporting this challenging expedition, an unsupported trek of the Laugavegur trail, during which a Distributed Training package was delivered to 4 members of the team who all achieved a pass in their Summer Mountaineering Foundation course. 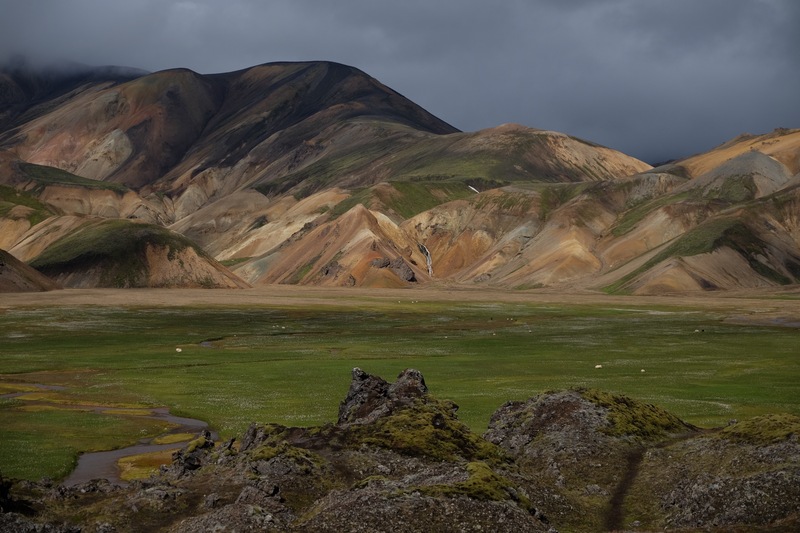 Landmannalaugar, the view from just above the first campsite. Trekking from Hrafntinnusker to Alftavatn.